You know what’s a yogurt match made in heaven? Cranberry and orange, that’s what. 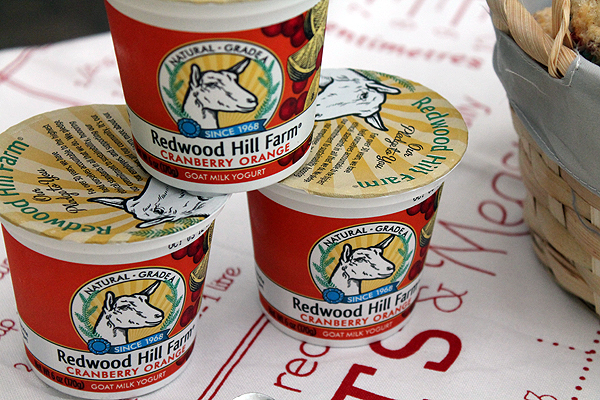 I had the opportunity to first try Redwood Hill Farm’s products at the Big Summer Potluck, and I was stunned by the creamy, tangy goodness of goat’s milk yogurt. This may sound weird, but I was really excited to see goat milk yogurt. I’ve lived first hand with a loved one with allergies to cow’s milk. For most of my sister’s childhood, she couldn’t eat or drink cow’s milk without getting horrible stomach aches and rashes. As an infant, she even had to drink goat’s milk instead of breast milk or formula – something my parents had to procure from a little old woman on the opposite side of town with a fleet of goats. With delicious flavors ranging from Wild Honey and Vanilla to my favorite, Cranberry Orange, Redwood Hill Farm is making it easy to love goat milk yogurt as much as I love goat milk cheese. 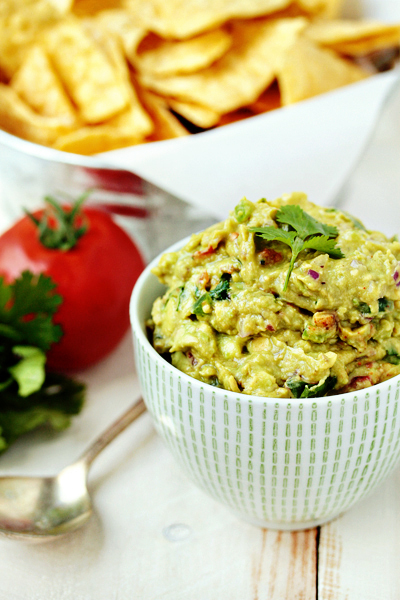 And it’s making an appearance in our fridge, and menu, a lot! That Redwood Hill Farm is one hip place, as far as I’m concerned. They make the pledge that their products are made WITHOUT antibiotics, added growth hormones, GMO’s or toxic pesticides. They don’t contain gelatin, refined sugar, preservatives, artificial colors or flavorings. And get this: the creamery where all the <a href="Redwood Hill Farm & Green Valley Organics products are made is solar powered. How cool is that?! 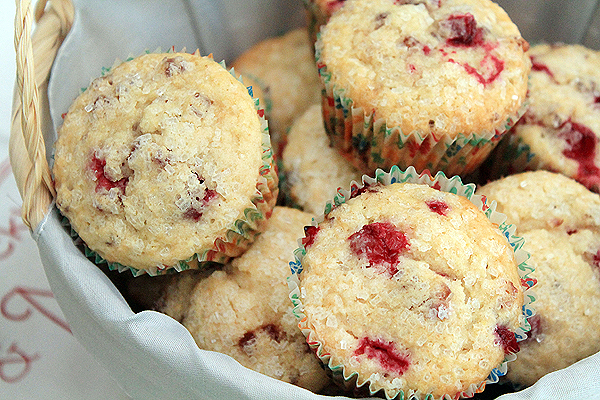 These Cranberry Orange Yogurt Muffins are exactly as I envisioned them to be – tangy, tart, and with the perfect crumb. 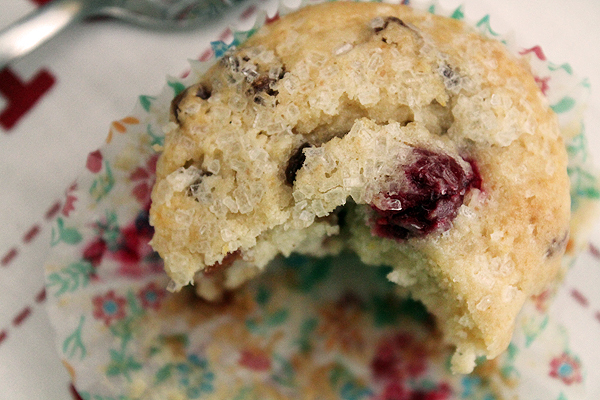 They’re not overly sweet thanks to fresh cranberries, but boy are these muffins HUGE on flavor. If you don’t have pancake mix on hand, you can substitute self-rising flour for the entire recipe, but if you can make it work, I suggest adding buttermilk pancake mix. Buttermilk only adds to the flavor pop from Redwood Hill Farm’s Cranberry Orange yogurt, and you’re left with an addictive muffin that you’ll want to eat for both breakfast and tea time. If you’d like to learn more about Redwood Hill Farm or Green Valley Organics, like them on Facebook or follow them on Twitter. Look for RHF and GVO products at Whole Foods Market, or buy it online through the Redwood Hill Farm website. * You can substitute dried cranberries if your grocery store is waiting until November to stock the shelves with fresh. Reconstitute one 6 oz package of dried cranberries in water for about 20 minutes, then add them to the batter as you would fresh. Preheat the oven to 400°F. Line a muffin tin with paper cups and lightly spray them all with cooking spray. In a large bowl, combine self-rising flour, pancake mix, and sugar. Whisk well to combine and aerate, then form a well in the middle and set aside. In a second, smaller bowl, combine yogurt, cooled melted butter, orange juice, and beaten eggs together. Stir or whisk together until all the wet ingredients are well mixed. Pour the wet ingredients into the well set into the dry ingredients and then fold them together gently until just combined. Add the cranberries and fold them gently again so that the cranberries are distributed fairly evenly. Use a large cookie scoop or ice cream scoop to place muffin batter in each muffin tin. Using a cookie or ice cream scoop will give you uniformly sized muffins. I got exactly 16 muffins from the batter. If using, sprinkle each muffin with white sparkling sugar. Bake for 18-22 minutes, or until the muffins are lightly golden brown. Allow to cool slightly in the pan, then remove to a wire rack and allow to finish cooling completely. Delicious at breakfast AND snack time, especially with a pat of butter and a glass of milk. 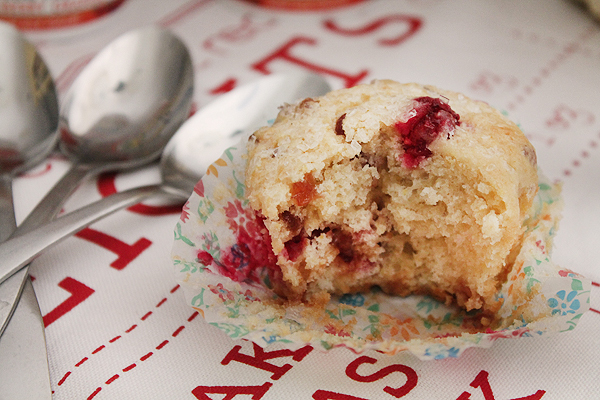 Cranberry and orange is one of my favorite combos… That yogurt sounds fabulous, and your muffins look really delish! Beautiful and they sound soooooo delicious! Looking forward to having a weekend to bake coming up! Thanks so much Amber, you rock! Aww, you all have all the neat yogurt flavors in the US. And that does sound like a great company! I wish I had access to their stuff. I love the crunchy sugar topping on these! Such a simple thing, but I think it always adds a lot. Cranberry Orange is one of my favorite flavor combinations! And everyone knows I have a weak spot for muffins. These look delicious. I don’t *have* a stash of fresh cranberries from last year- is it fall yet? And I agree, there’s just something about goat’s milk that’s so refreshingly tangy. I think it makes a truly superior yogurt. These muffins are gorgeous! 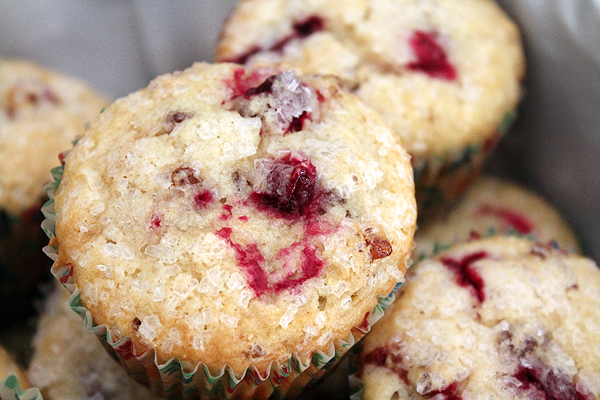 I just love anything with fresh cranberries…I have to go check my stash from last year and see how much I have left. Also, I just love the look of the coarse sugar on top…I have to get back to my search to find some! Cranberries and orange are made for each other! These muffins must be undeniably amazing. Hey Ashley, thanks for your comment! They are definitely one of the best muffins I’ve ever made. Such a great combination of flavours, cranberry and orange are a match made in heaven and I really like the idea of using goat’s milk yoghurt in them. Hi Annie, thank you so much for your comment. I’m so sorry for your loss. What I was referring to with Amanda is that in July 2011, I lost my grandmother. For me, this was a hearty blow because she was my best friend, my sounding board, and one of the reasons I started this blog. I posted on the day she died, about baking fresh loaves of bread kneaded with my own two hands. It was exactly the thing I needed to do to honor her, and the influence she had on my life. I still bake bread and think of her. That post means so much to me. I hope that we can get to know each other, and that you like the recipes you find! Thanks, Katrina! We really enjoyed them.